Make posters on various topics. They can be dedicated to the festive events. The most popular of all children's greeting posters on birthday. You can draw or make a poster for a child of any age. Place there pictures of the child in different years of his life. Or make an unusual poster with a calendar that will count down the age of your child. Such posters will definitely create a festive atmosphere in your home. You can buy similar posters for the birthday of the shelf in any bookstore. But your child will be much more pleasant not only to see the poster, made by your hands for him, but also to take an active part in its creation. Download the poster template from the Internet to a pdf file or files. Unzip it and follow the instructions. The most common poster template consists of 8 sheets of A4. Print out the 8 fragments of the poster to the printer. It may be black-and-white printing, and color. If you want to paint a poster or give it a fantasy for your child, it is better to use black-and-white version. Printed fragments of a poster mate. Then glue the leaves to each other. If you want to achieve integrity, mount them on poster Board. Enjoy coloring using any of the methods: paint, pencils, markers or crayons. There is an option to make a thematic poster. A sort of collage of your child's life. To do this, take the drawing paper, pictures of your child from birth to the present time. Mount them on poster Board, draw a beautiful frame and sign. So guests will know about your child's achievements: first smile, first tooth, first step. Add pictures with your parents, and grandparents. And admire the result! You can come up with endless ideas for this greeting posters. 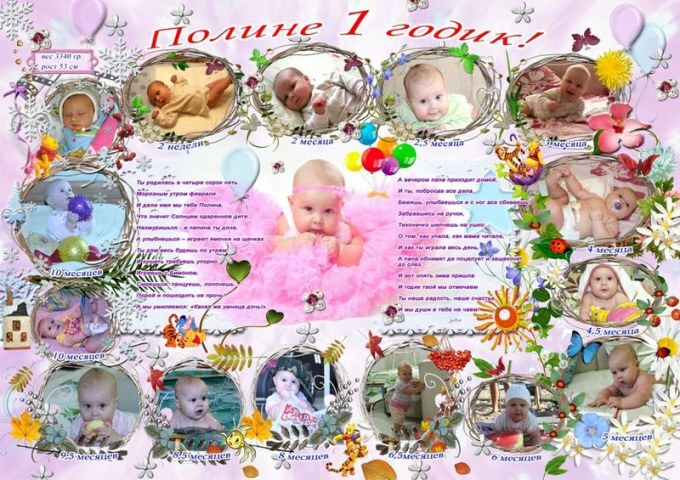 Humorous poster make in the centre was the main greeting, and around - baby photos with funny captions. Certainly in your family album is stored funny photos taken in a dream, while swimming or for a walk. An interesting variant - poster "who I like". In the center of the poster place a picture of baby, and on the sides of mom and dad in childhood. Add photos of grandfathers and grandmothers. Let your guests to guess who is more like a child. It is fascinating and funny. If you are good with Photoshop, you can edit the photos for the poster as you like. Change the size, color scheme, try applying different decorations that are standard with this program.